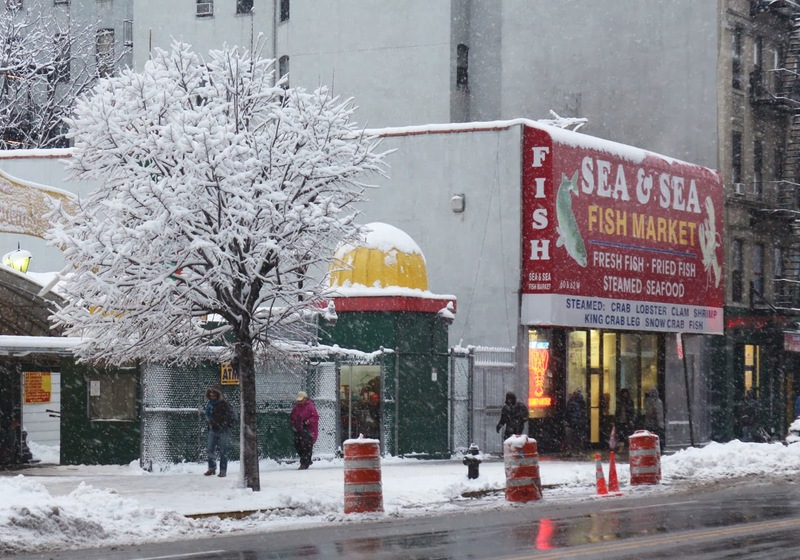 After my walk-in-the-snowy-park the other day I stopped at Sea & Sea, on 116th. It was my third visit. The first time, with Vince, we stood like giant white fish out of water, opening and closing our mouths as some incomprensible system worked smoothly around us. But by looking stupid and touristy enough someone eventually asked us what we wanted and that is how we got our giant fish sandwiches. Three crisp fillets were fried to order and slapped between between two slices of Wonder-ish bread. We ate them - at least, as much as we could - on a park bench in Central Park a few blocks south. The second time, on my own (also in the snow, now that I think of it), I requested two fillets, please, and expected opposition, as well as to pay for a full sandwich (a whopping $3.50). But I simply got what I asked for, no questions asked, and a dollar off the price. That time, I doused my fish with hot sauce and a little salt before the fryman wrapped it up in wax paper and slipped it into a small brown paper bag. I ate it walking north on Lenox. Good. Very good. So now I was ready for a purchase of whole fish from the Ice Wall, that piscine Maginot Line staring at you from the ice chips in the east. All kinds of fish. From carp to catfish to giant things called sheepsheads, to flounder and snapper and butter fish and barracuda and porgy and sea bass and whiting. A woman shopping ahead of me had a stainless steel bowl. So I grabbed one, too. She fetched some red plastic tongs and aimed for her fish. So I found some red plastic tongs and started studying the fish, too. I landed up in front of some yellowtail snapper. Pleasingly pink with yellow stripes and tails. Memories of Miami. I looked at their eyes, carefully. They were bright. Not a lot of other bright eyes in the wall, that day. I stuck my tongs into the ice, gripped my snapper and pulled. Nothing. I wiggled. The fish started to budge. I put some discrete muscle into it, got a firmer grip and yanked. The fish broke free and flew - just - into my bowl (and the crowd went wild!). Success. Two more, and I carried them to the back, where a row of men takes money, weighs fish, and cleans them. Mine were weighed, and given to two men in yellow oil slickers to be filleted. A woman behind me brought a bowl with two heads of a pointy-faced monster fish to be weighed. $20 was too much for her and she sighed and murmured before retiring. 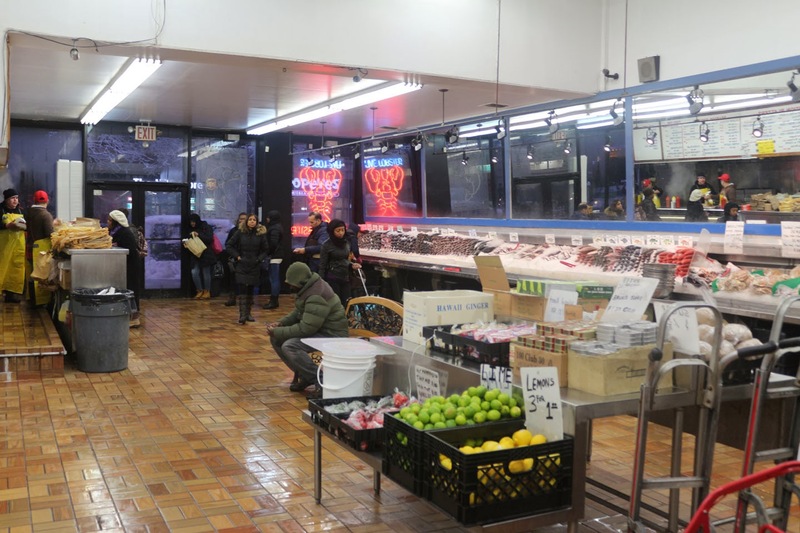 A young woman brought a bowl of shrimp and a dish of broccoli to be weighed, and then carried them to the cooking station at the front doors, where you can have you dinner fried or steamed while you wait. A tall West African man waited with a bowlful of crabs. There is a lot of fresh produce - in individual, clingwrapped trays: vegetables like broccoli, okra, snap peas or cauliflower. 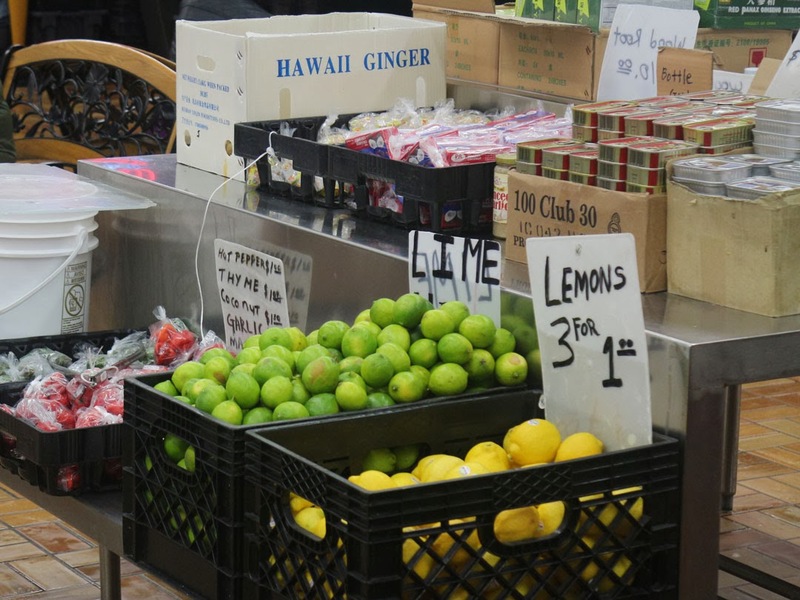 The lemons, three for $1, are the most reasonable in the hood. Then there are extras, like Scotch bonnet peppers, peeled and whole garlic, fresh ginger and bunches of thyme. Behind me, as I waited, were tanks of live crab and lobster. Two girls walked past with bags of snowcrab legs. My camera lens had fogged up so I couldn't take pictures until the minute it cleared, when I was handed my bagful of cleaned fish. The men had shown me my fish bones and asked if I wanted the heads, too. They had been told, they said seriously, that I would not want the heads. I did want the heads, I assured them, so heads remained attached to the backbones. And that was that. I had my fish. Bouillabaisse would follow. I felt like I'd passed some kind of test. Next time, I'll get fish and chips. Sounds amazing. Wish we had something like that here. Also thank you for eating your fish with vinegar. I generally have to bring my own because most restaurants don't serve it and people look at me strangely when I ask. You are bold! I like vinegar with fish-n-chips that come in a bag. What an incredible place! Nothing like that in my neighborhood. If there was, it would be very popular. How did you cook the snapper? The snapper was deconstructed into bouillabaisse. Estorbo probably wanted to be your best friend when you came back from that store. Stuck his head right in the bag. Your stories of New York are fascinating. Thank you. Found your blog via Estorbo... Enjoying your cooking/eating adventures very much. Fascinating, I'd have no idea what to do in a market like that! What a find! There is nothing like that in these parts. Last time i bought fish ... one man was dumping it out of those bags of frozen fish while a seond arranged it prettily inthe case. Yuck! What a great adventure. Outside only the biggest of cities, it would be hard to duplicate your very fun experience…. Yum! What an amazing sounding place. As much fun to watch everything in action as to actually shop for your supper, by the sounds of things!